Meet Sophie LaCroix, a creative soul with a desire to become a great film director someday, and she definitely has a flair for drama! Her overactive imagination frequently lands her in trouble, but her faith and friends always save the day. This bindup includes two-books-in-one. Sophies First Dance: Sophie and her friends, the Corn Flakes, are in a tizzy over the end-of-school dance  especially when invitations start coming  from boys! Will the Flakes break up, or can Sophie direct a happy ending? Sophies Stormy Summer: One of the Flakes is struck with cancer, and Sophie severely struggles with the shocking news, until she finds that friends  and faith  show the way to a new adventure called growing up. Sophie and Friends by Nancy N. Rue was published by Zondervan in April 2013 and is our 25709th best seller. The ISBN for Sophie and Friends is 9780310738527. 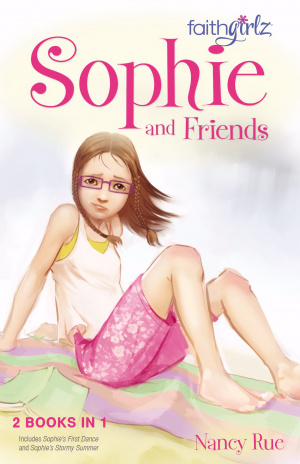 Be the first to review Sophie and Friends! Got a question? No problem! Just click here to ask us about Sophie and Friends.